I'm a very bad blogger. I have nothing to say but I'm sorry for the long period of silence since Thanksgiving. I got back from Tennessee where I had a very nice Thanksgiving for the most part. The dinner at the Martha Washington Inn was pretty good. The only two things that the entire party agreed upon was the stuffing was pretty bad and we missed the crispy skin of the turkey (the kitchen had taken all the skin off before carving the turkey). Also, I had the worst Bloody Mary I've ever had because the bar tender wasn't working and the wait staff was mixing drinks. The prime rib and apple crepes were fantastic and they had a self saucing chocolate cake that was to die for. The green beans and smoked salmon were great too. Of course while I was down there I had plenty of good Southern cooking. I had green beans with salt back, buttermilk biscuits, homemade pecan pie and sweet potato pie. One of the neighbors brought over butterscotch pie right from the oven. It was like eating the best homemade butterscotch pudding with a big fluffy cloud of meringue with a flaky crust underneath it all. We each had a big piece for dinner that night! Just look at all that cured pork goodness. I've got all sorts of dishes planned for this porcine wonder. Things like country ham and biscuits, split pea soup and ham, sweet potato and ham casserole, country ham and scrambled eggs. I'm sure I'll have to share some with the cat too. But only little scraps. My fridge smells fantastic every time I open the door and I find myself fondling the ham when I am rummaging around looking for things like yeast and flour to start my Christmas baking. 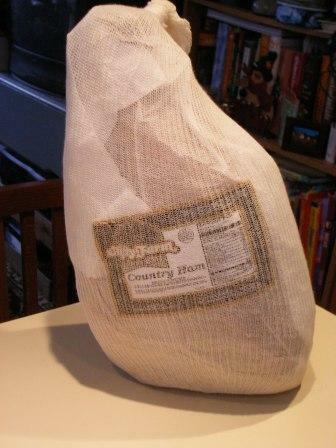 If you had a whole country ham, what would you fix?